When it came to its latest sneaker collection, Converse dug deep—literally. The result? 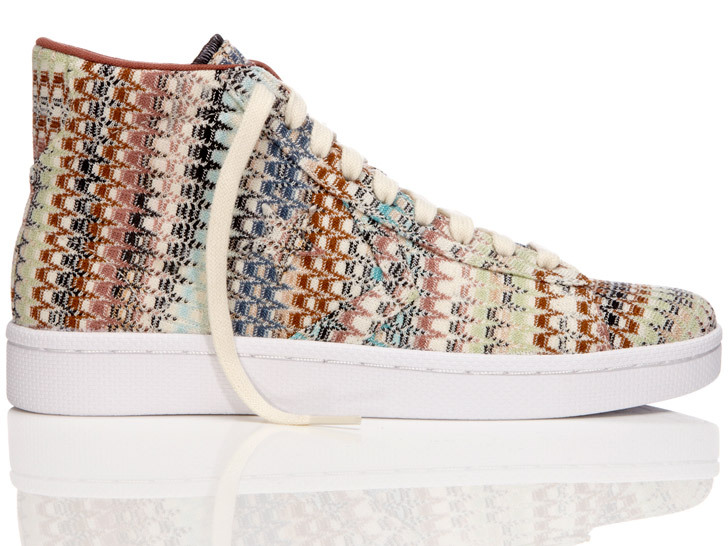 The "Converse x Missoni Archive Project," a series of 20 one-of-a-kind kicks created using unique deadstock fabrics from the Missoni archive. Unveiled at Paris Fashion Week on Friday with a bespoke installation at Colette, the project celebrates the two brands' longstanding collaboration, now in its sixth season. Gary Card, a London-based set designer and illustrator, borrowed cues from the collection’s “star chevron” logo to create his oversized shoe tree, a towering sculpture that rises from a star at its base into a sequence of outstretched chevron-shaped protrusions. He then clad the tower in a monochrome version of the Italian fashion house’s signature zigzag pattern. The deadstock fabrics are “colorful, eclectic, and completely reinvigorated” by the juxtaposing colors and textures. Likewise, Converse turned two of its iconic silhouettes—the “Pro Leather” and “Auckland Racer”—into blank canvases for myriad Missoni fabrics that debuted in runway collections from 1994 to the present day. No longer available, the archived fabrics are “colorful, vibrant, and eclectic, and completely reinvigorated” by the juxtaposing colors and textures, according to the two companies. Accompanying the project is a hardcover book, produced in limited quantities and individually numbered. Each volume is bound in the same terracotta canvas that lines every pair in the collection. The Converse x Missoni Archive Project is part of “Converse First String,” a limited-edition initiative that celebrates craftsmanship, authenticity, and collaboration par excellence. Each shoe is available exclusively at Colette in unisex sizes ranging from from US 5 to 12. Don’t expect budget prices here: The shoes retail at €400 per pair. For shallower pockets, Converse will launch the Holiday 2012 Missoni for Converse Auckland Racer on October 31 at Missoni boutiques and select Converse First String retailers worldwide. Where can I get those sneakers..
Gary Card, a London-based set designer and illustrator, borrowed cues from the collection's "star chevron" logo to create his oversized shoe tree. The installation is a towering sculpture that rises from a star at its base into a sequence of outstretched chevron-shaped protrusions. Card also clad the tower in a monochrome version of the Italian fashion house's signature zigzag pattern. Likewise, Converse turned two of its iconic silhouettes—the "Pro Leather" and "Auckland Racer"—into blank canvases for myriad Missoni fabrics that debuted in runway collections from 1994 to the present day. No longer available, the archived fabrics are "colorful, vibrant, and eclectic, and completely reinvigorated" by the juxtaposing colors and textures, according to the two companies. “The Converse Pro Leather and Auckland Racer shoes each helped to usher in the modern era of basketball and running respectively," says Penny Ericson, vice presiden of Converse Jack Purcell and Premium. She adds: "We are excited to unite these iconic designs with the rich heritage of Missoni and the inspiring artistry of Gary Card." Accompanying the project is a hardcover book, produced in limited quantities and individually numbered. Each volume is bound in the same terracotta canvas that lines every pair in the collection. The Converse x Missoni Archive Project is part of "Converse First String," a limited-edition initiative that celebrates craftsmanship, authenticity, and collaboration par excellence. 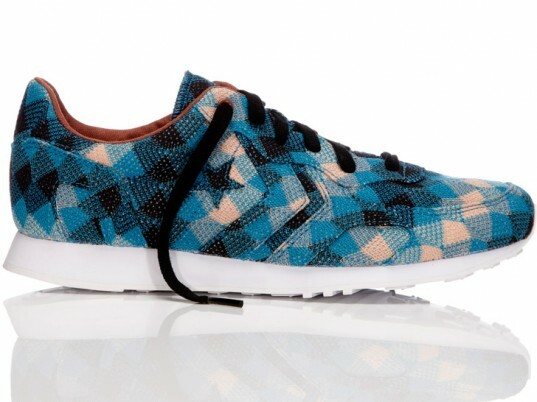 Each shoe is available exclusively at Colette in unisex sizes ranging from from US 5 to 12. Don't expect budget prices here: The shoes retail at €400 per pair.